While not nearly as entertaining or informative as Monday's huge treasure trove of new details, the anonymous blogger behind Inside Sprint Now has returned to reveal some additional behind the scenes Palm Pre info. 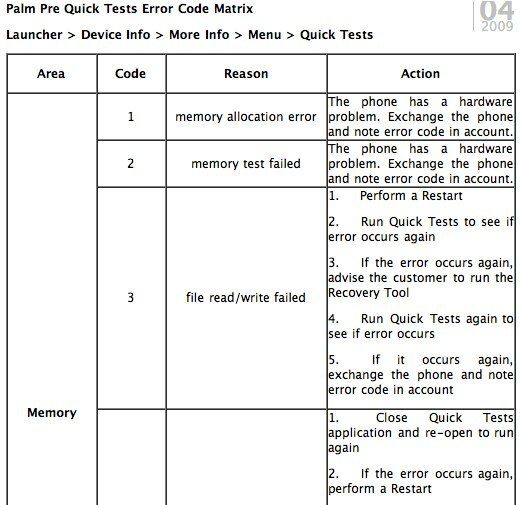 This latest post lists the full assortment of Pre "quick test" error codes for support personnel. The error codes are quite comprehensive and detailed in their explanations. Evidently these have been lifted right out of a Pre technical manual for Sprint customer service reps or technicians. According to Inside Sprint Now, this Quick Test screen is a sub-function of the "Device Info" icon on the WebOS launcher. The categories covered in the matrix deal with all areas of potential trouble for a modern smartphone: Memory, Wi-Fi, Bluetooth, and Modem. Interestingly enough, no mention is made of GPS troubleshooting in the quick test menu.